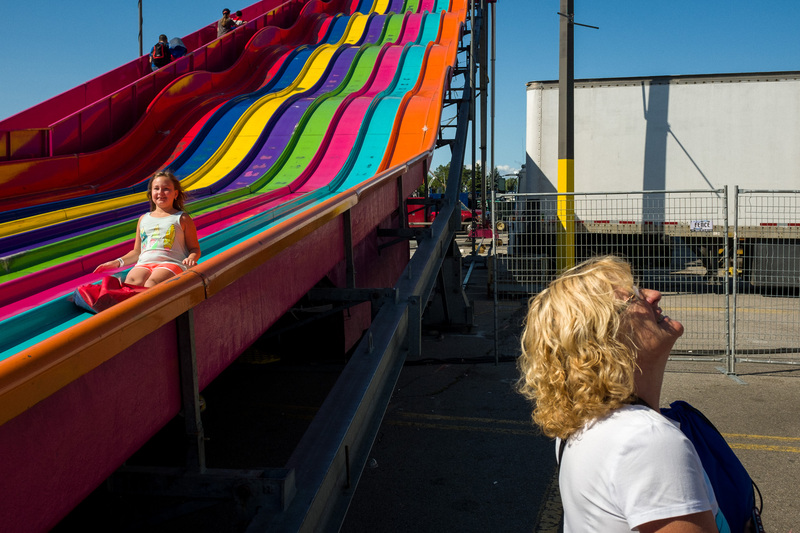 The Canadian National Exhibition (CNE) marks the unofficial end to summer for many Canadians. The many rides and exhibits attract hundreds of thousands of people every year and it’s a great chance to flex your street photography muscles. 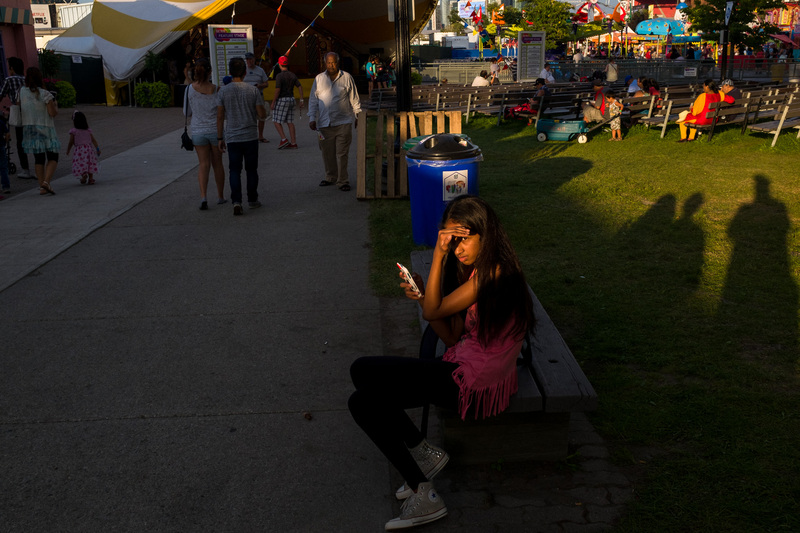 But what does it take to shoot a large multi-day event like the CNE? 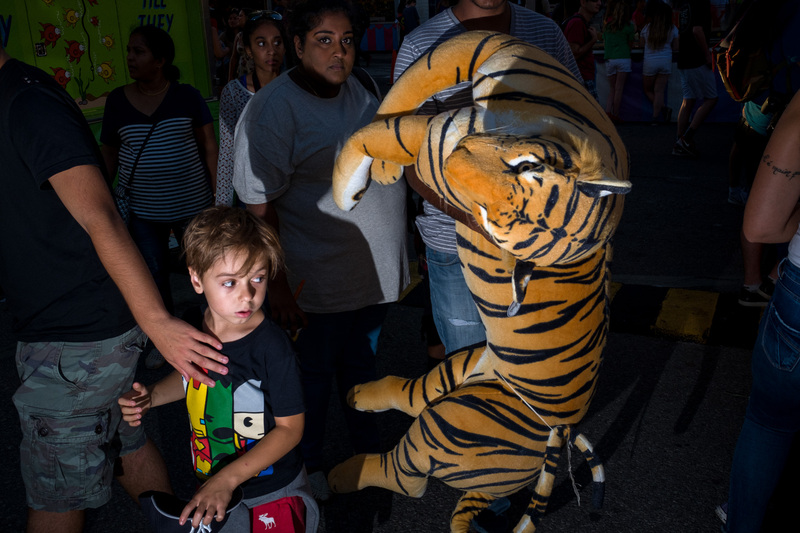 After 6 days of shooting I’ve compiled a series of tips in my Street Photographer’s Guide to the CNE. Hit the jump to read all about it! 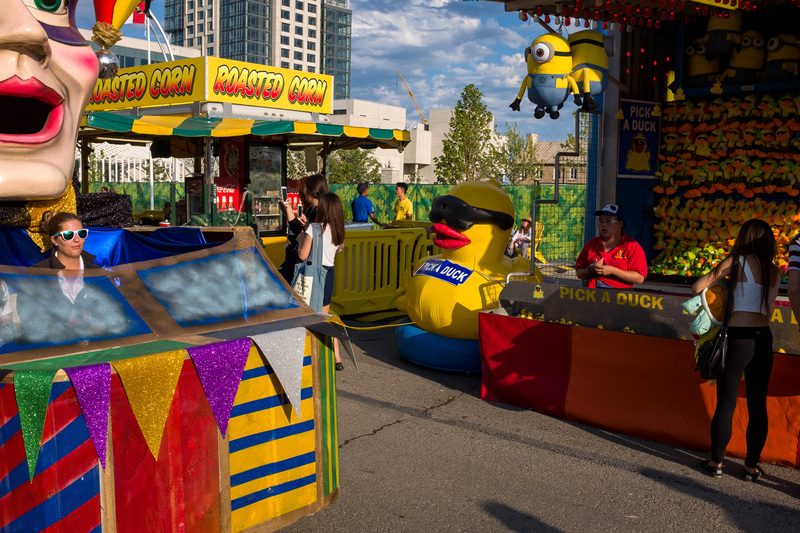 The Canadian National Exhibition (CNE) is Canada’s largest community event and one of the top 10 agricultural fairs in North America. It’s sort of like the Canadian version of a state fair with a huge midway and hundreds of exhibits and shows. The event happens during the last two weeks in August making it the unofficial end of Summer for many Canadians. And it’s one of my favorite places to shoot! But covering a large scale multi-day event like this can be daunting for even the most seasoned street photographers. 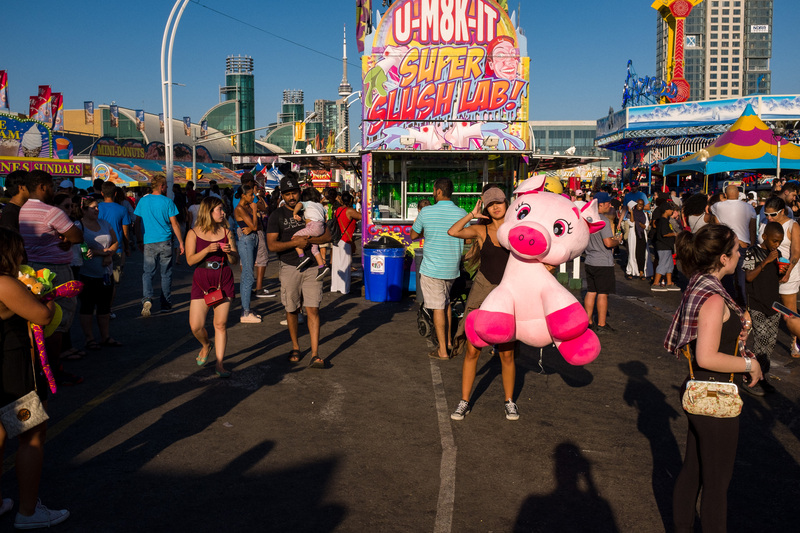 Here’s a few tips to get the most out shooting the CNE (or any other large scale community event) and with a bit of luck you’ll come back with some killer shots! All images © Karl Edwards. Click any image to enlarge. 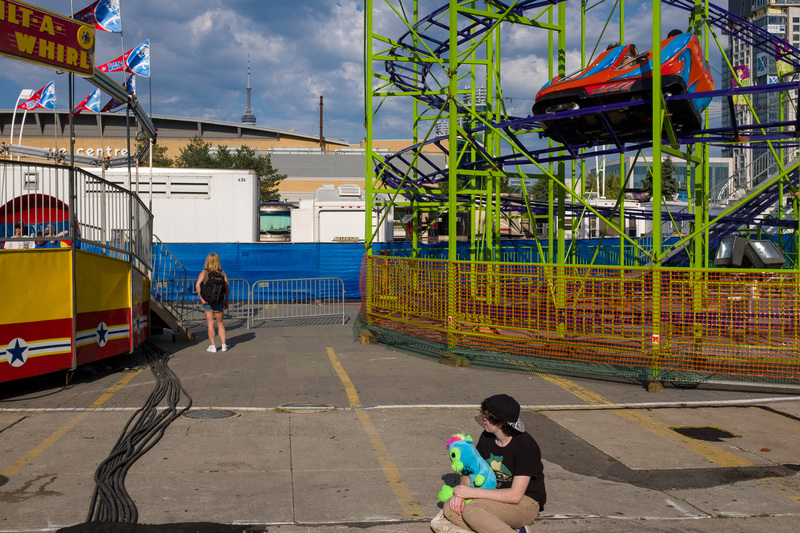 I normally spend the first day of shooting at the CNE by getting the lay of the land. I like to scope out the place and make a plan for extra days – making notes when I see something interesting and returning to that location at different times of day to see how it looks. A location that’s hidden in shadow in the afternoon might be lit up beautifully in the morning. I also know I’m good for about 4 hours of walking around before I’ve had enough so I attend the event during the times of day when the light would be the most interesting. For me, that’s from about 4pm to 8pm. As it turns out the CNE has a special on weekdays and you can get in after 5 pm for only $6 so I planned to be there as many times as possible. There are tons of events at the CNE like the air show and open air concertss that can be excellent street photography opportunities. Plan your shooting trips in advance and you’ll have a great starting point for your photographic exploration. I’m pretty much obsessed with the midway at any fair or amusement park. Mabye it’s the rumble and roar of the engines that power the rides. Maybe its the sheer joy and escapism. Adults are free to be kids and kids are free to fly through the air! However you look at it the energy is perfect for my style of shooting. I try to cover as much of the CNE as possible but I find that I’m always drawn back to the midway. I wait for the light then start shooting and see what happens! 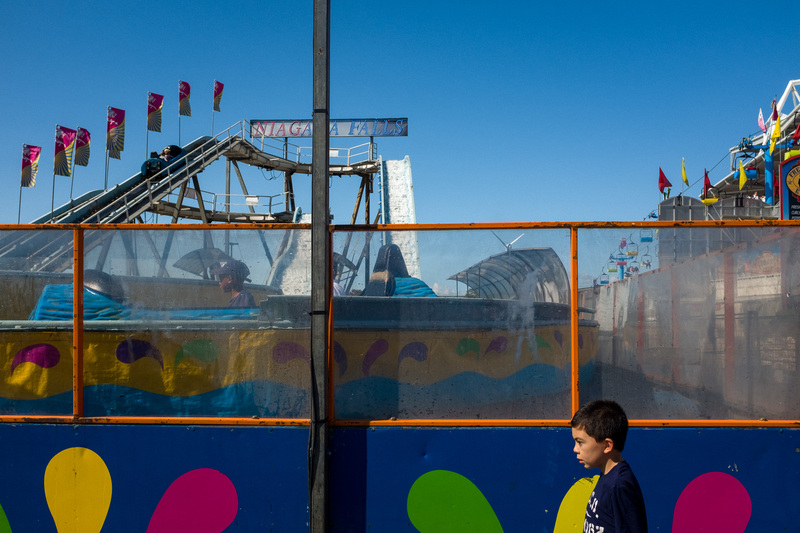 Space is tight at the CNE and the rides, games and attraction are piled on top of one another. This is a great time to pay attention to layers in your images. What’s happening in the background? Does it compliment the main subject of your image? Great images typically have many interesting layers with multiple subjects playing against each other in the frame.It’s one of the most difficult things to do in street photography and it takes patience and timing to find the right combination of elements in a frame. I think it was David Alan Harvey who suggested watching the background and letting the foreground take care of itself and this technique works well for me. Sort of like driving a car when you focus on infinity and use your peripheral vision to see the things closer to you. Start with two or three elements in the frame and slowly add more elements as you get comfortable shooting in this way. It’s not easy but it’s definitely worth it! I’m inspired by light. Even the most mundane situations become magical when the light is epic. 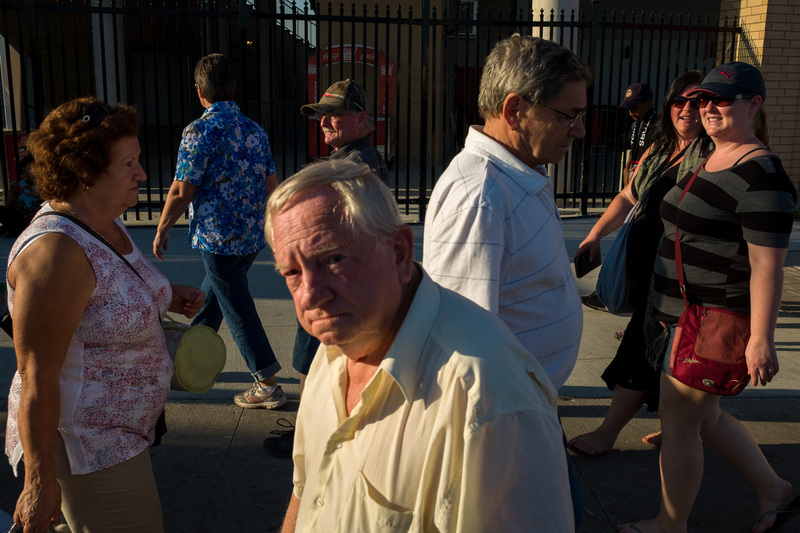 So I pay attention to the way light interacts with subjects at the CNE and follow it as the sun slowly descends in the late summer sky. 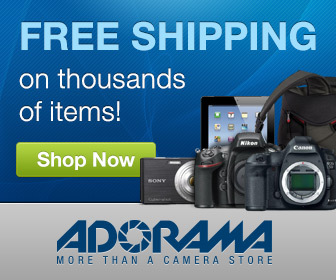 Watch for tiny slivers of light that highlight individuals along the way and shoot everything! Over the past year the city erected a new stadium on the CNE grounds to house Toronto’s pro soccer and CFL teams. This is great for sports fans but it casts a tremendous shadow on the midway and blocks the richest light in the late afternoon. While this was disappointing, it forced me to explore other areas of the CNE grounds after about 5:30 pm. There was a secondary children’s midway (or kidway) on the other side of the stadium so I found myself poking around over there when the adult midway was in shadow. In some ways I think this was a boon to my shooting as it forced me out of my comfort zone every day and allowed me to see new areas of the CNE that I might have otherwise missed. My best shots are still from the main midway but I got a few memorable shots at the end of the day in the kid’s area. 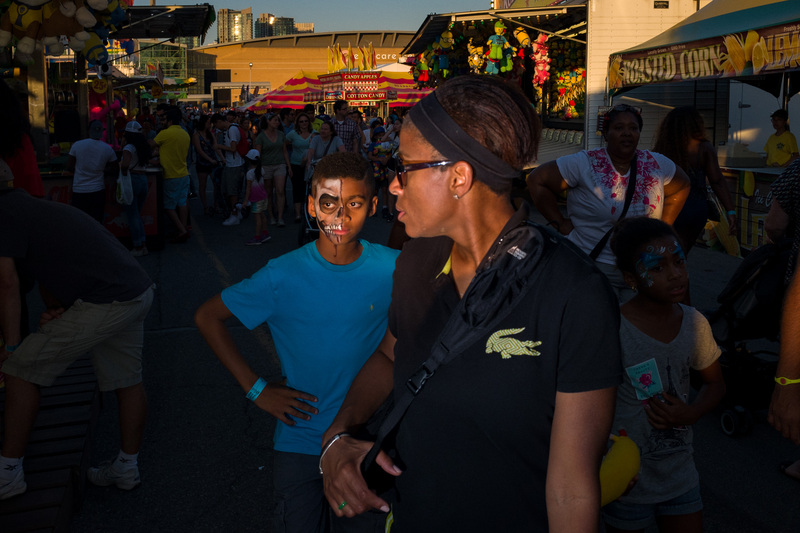 Depending on the day you can run into huge crowds when shooting street at a large scale event like the CNE. I look for interesting scenarios or gestures that literally stand out from the crowd. Watch for gaps or openings in the sea of humanity and use light and color to bring focus to your subject. Let the crowd disappear in the context of the shot. There are lots of areas where buildings, rides and other structures prevent a large crowds from appearing in the background. But avoid the temptation to use this environment as a simple “backdrop” for boring shots. Pay attention to the relationships of elements in the frame and try to make interesting images. Shots like this (where the composition IS the subject) are difficult to pull off and you typically need a stand out moment to make the image shine. Gilden typically shoots people that exist on the edge of society; people who have been “bruised by life.” So I think he’s being somewhat metaphoric in this quote but there’s some merit in taking his advice literally. Wander around the outskirts, the last places to stop before the parking lots or exits. See what’s happening away from the main event and you might find a whole new world. It’s a different energy from the midway but there’s plenty of cool stuff to see if you look in the right places! Flash street photography. You either love it or hate it. But when the sun starts to go down, you can extend your shooting day and light up the world with a flash. Try to remember that people aren’t used to seeing flashes go off so you should be prepared for confontation. Even though I quoted Gilden in the previous section, I’m not suggesting you jump out and flash people Gilden style! He got some great shots with his technique but it’s a recipe for confrontation so be prepared! Keep your wits about you and focus on what matters most about your own images and you’ll be fine. I typically act like nothing happened when I shoot with flash. It’s just light after all and doesn’t affect the world in any other way but to illuminate it. There’s no way to hide the fact that you’ve shot with a flash so embrace the moment and concentrate on making interesting images. There are plenty of tips for using flash street photography including the Two Cute Dogs Guide to Flash Street Photography right here on StreetShootr. Flash is a great way to fill in the shadows or even be your primary source of light for a shot. 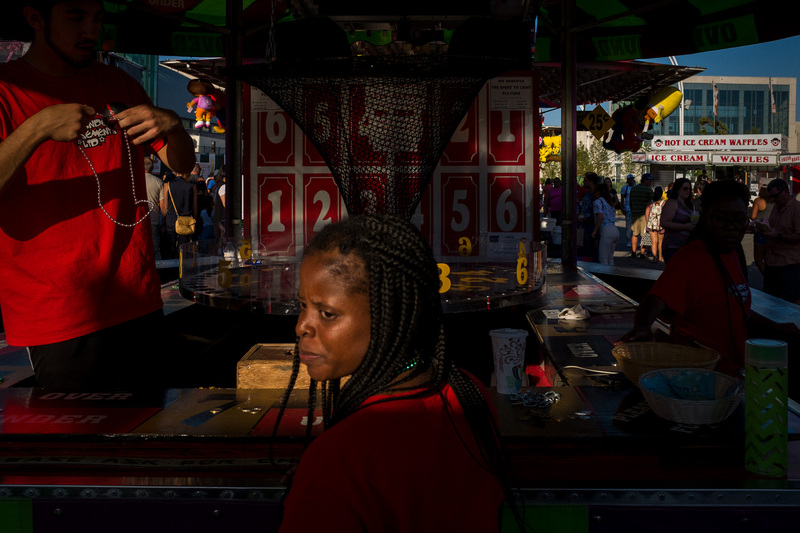 With all the rides, games and excitement it’s easy to forget that people are at the heart of most street photography. Stop taking picutres of people walking think about human beings and their many moods and inflections. Look for the expression or gesture that defines the moment. All images in this article were taken by me during the 2016 CNE. The images were shot with the excellent Fuji X100T and (where applicable) the Fuji EF-X20 flash used off camera in manual mode. 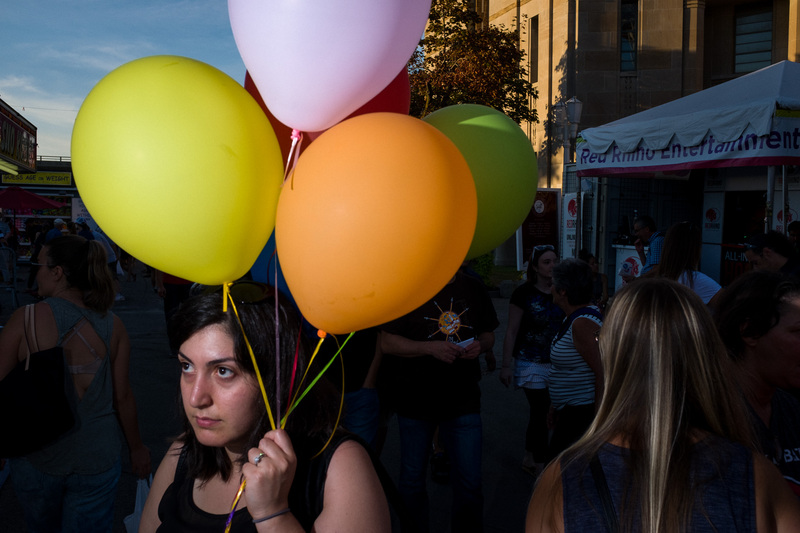 What’s your take on The Street Photographer’s Guide To The CNE? Are there too many people for you to comfortably shoot an event like this? Or is it a wonderland waiting for the right photographer to find its best moments? Post your ideas in the comments below and keep the conversation going!